Passive solar energy designs use the energy from the sun to heat, cool, and illuminate our buildings. Solar energy is a renewable energy resource made from sunlight and nearly all of the renewable energy sources we use today comes directly or indirectly from the sun. Solar energy is environmentally friendly, and unlike traditional fossil fuels, passive solar energy is available just about everywhere on Earth. The heat and light that comes from the sun can be used in many ways to make electricity, to provide heating and cooling for buildings, or to heat water. Potentially the sun is our most abundant source of free energy and even if a small portion of this energy were harnessed, it could solve many of our current energy problems. One way of harnessing this immense power to reduce the heating and cooling demands of a building is through the use of Passive Solar Energy. Passive Solar Energy is the use of solar energy by passive means to reduce the heating demand of a building. 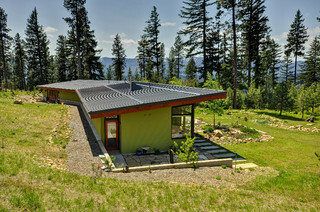 A “passive” solar house provides solar cooling and heating to keep the home comfortable without the use of any mechanical equipment such as pumps or fans. Passive solar energy relies purely on the design, positioning and style of construction of the home (or other building) allowing it to respond to the environment with nature doing most of the work. Then passive solar energy systems are primarily concerned with the design of buildings. Passive solar design focuses on the placement of the home or building and on windows, ventilation, and insulation to cut down on the need for electricity by using the sun. Anyone who has sat by a sunny, south-facing window on a winters day has felt the effects of passive solar energy and the home or building is designed to maximize the potential of this solar energy for heating and cooling so a good solar house design is tailored to the local climate and environment. There are several types of passive solar energy designs for buildings and these include: direct gain, thermal storage, solar greenhouse, and convective loops. The simplest form is the direct gain design in which a large south facing (in the northern hemisphere) window, usually double glazed, is used to allow sunlight into the building. The energy in the sunlight entering directly through the windows is absorbed, converted to heat, and stored in the thermal mass of the walls and floor. But as well as using solar energy to heat our homes and buildings, we can also use it to cool them as well. Where as passive solar heating designs collect and store thermal energy from direct sunlight, passive solar cooling can help minimise the effects of the solar radiation through the shading of windows or creating air flows using convection ventilation. Passive Solar Heating is most cost-effective way of warming buildings and the goal of any passive solar heating systems is to capture and store the sun’s heat within the buildings materials and then release the heat during periods when the sun is not shining. While at the same time the buildings elements are absorbing the suns heat for later use, there should also be enough solar heat available for keeping the living space comfortable and warm for normal daily use. We have all seen that when an object absorbs sunlight it gets hot and we can put this to good use by allowing sunlight to pass through a window and be absorbed by the building striking directly and indirectly the thermal mass materials in the house, such as masonry floors and walls before being converting into heat. Houses heated by passive solar energy have energy efficient windows that face south, so they absorb as much heat as possible from the sun. Once the heat has entered the building, various techniques come into play to keep and distribute it. While direct sunlight through south facing windows can heat up a building quickly, it is much more difficult to control without the aid of a thermal mass storage wall. The thermal mass of buildings is a common concept in passive solar design. All materials can store heat to some degree so making use of heavy mass materials in the walls, floors, and ceilings gives them a higher thermal mass or heat capacity. For example, concrete and masonry are good heat absorbers so the floors and walls can be constructed from these materials. In the hot summer time, any excess heat will be absorbed by these thermal masses to help cool down the building. Also painting the floor and walls in darker colours will help absorb the heat better. Once the heat is in, a well insulated and air tight building design helps prevent heat loss and allows the solar heat to provide more of the heating needed. Then the crucial component of the passively heated building is in the window positioning and design and passive solar energy makes good use of this. While normal glazed windows let heat escape, high performance windows with insulated frames and spacers, low emission ratings and multiple glazing filled with inert gas or vacuum fills, can help reduce heat loss back through the windows by over 50 per cent in most cases. Conservatories are also an effective means of bringing thermal energy into houses by means of conduction through a shared mass wall in the rear of a sunroom or by using vents that allow the air between the sunroom and living space to be exchanged by natural convection. A brick chimney between a sunroom and the living room can also act as additional thermal mass. A south-facing home having an attached conservatory can in the hot summer months, use of blinds, curtains or awnings to block the sunlight and prevent the building from overheating. But as well as large south facing windows and high efficiency windows, modern passive solar thermal designs use buildings with high (R-20) levels of wall insulation and air-tight construction to keep the heat in, when it is cold outside and keep the interior cool when it is hot outside. With the heat contained, often a simple ceiling fan is all that is required for the heat to be distributed around the building. Passive Solar Cooling is another use of passive solar energy and the opposite to passive solar heating. Passive solar cooling is more about reducing heat build-up rather than about taking it away. Cold is nothing more than the absence of heat and most of us associate cooling and air-conditioning with self-contained electromechanical HVAC devices connected to an electric power source, but the need for air conditioning in the building during the hot summer months can be greatly reduced or even eliminated by using passive solar cooling. Passive cooling systems have the same basic components as passive heating systems, but work in a different manner. Producing cooled air by making use of solar energy may seem a bit odd at first sight because we tend to view the sun as a source of heat. However, with passive solar building designs and the use of the right materials it is possible to remove heat thereby cooling our homes and buildings as well as heating them using the power of the sun. The obvious way of shading a building is with the use of shutters, awnings, curtains and landscaping with trees, while still admitting a significant amount of indirect light. From a passive solar viewpoint, the most effective method of shading is on the outside of the building using overhangs which block the sun during the summer months but allow sunlight to enter the building during winter. When designing with passive solar cooling in mind, heat from solar radiation and heated air should be kept from reaching the building. Natural ventilation relies on the natural airflow and breezes through windows on opposite sides of the building to reduce the need for mechanical cooling when the building is occupied. Also cross ventilation will help distribute the heat more evenly around the building keeping it cooler. Passive solar cooling techniques include carefully designed overhangs and using reflective coatings on windows, exterior walls, and roofs. Another way to achieve passive solar cooling is to combine shading with natural ventilation. We can design or modify buildings to use this moving air to cool the building so that the heat of the sun creates convection currents which draw cool air into the building from outside as heat rises, and cool air sinks helping to reduce the inside temperature. Solar energy may be excluded from the interior of a structure by building walls that have good thermal insulation or cladding. Thermal insulation in walls can keep heat out of a structure during the summer and keep heat in during the winter. Expanding foam can also be used which is pumped into the wall cavity, which then fills the gap and insulates the home. The sun is free, it only makes sense to use it so by using passive solar energy design to heat and cool your home you can be both environmentally friendly and cost effective. The term “passive” indicates that no additional mechanical equipment is used so any solar gains are brought in through windows with the minimum use of electrical pumps or fans to distribute the heat or produce an effect cooling. This results in a building that responds to the environment. Heating and cooling with passive solar energy is not as easy as you might think. Capturing the sunlight and putting it to work is difficult because the solar energy that reaches the Earth is spread out over a large area. The sun does not deliver that much energy to any one place at any one time. The amount of solar energy an area receives depends on the time of day, the season of the year, the cloudiness of the sky and how close you are to the Earth’s equator. But a well designed passive solar house will have comfortable, even temperatures all year round and make good use of natural light. It will therefore require less energy to heat, cool and illuminate than a conventional house. Hence it will also create less greenhouse gas emissions helping you save money and the environment. Passive solar energy requires buildings to be located and designed so that they interact with the environment and climate in a positive manner so a passive solar home requires careful design and siting, which will vary by local climate conditions. If you are considering passive solar design for a new home or a major remodel, consult an architect familiar with passive solar energy techniques. To gain a better understanding of how “Passive Solar Energy” works, or to obtain more detailed information about passive solar design and architecture, then Click Here today to get your copy from Amazon of one of the top books about passive solar energy concepts and practical ideas and ways you can use to heat and cool your home just by using passive solar designs. solar houses that do not use electricity for heating have been around in California for a long time. The strategic placement and orientation of heat absorbing internal walls and surfaces that are able to reflect the daylight. Any extra heating is with an open wood fire which can have a back boiler for hot water too.